Have you shopped the early access Nordstrom Anniversary Sale yet? No this is not another post about that sale. I'm sure you all are sick of seeing all the bloggers post about it, especially if you don't have a card and aren't able to shop early! Today's splurge, however is included in the sale. So if you want to spend the extra money on these Dolce Vita Tommi Perforated Bootie, I suggest to do it now while the sale if going on. 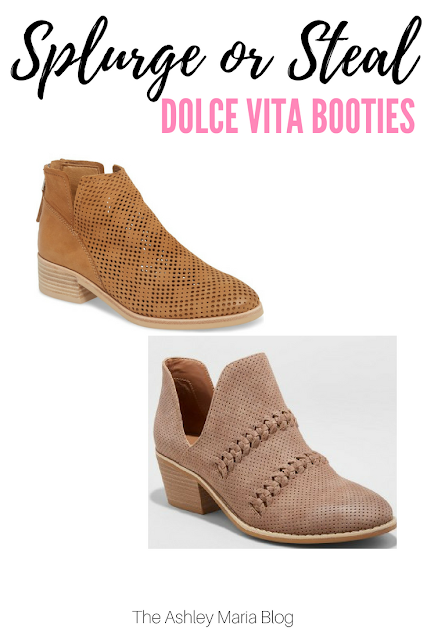 The Dolce Vita bootie comes in Smoke (which is more of a taupe color), Black and Tan (shown below). They also fit true to size. In my opinion, I would be wearing these a lot with skinny jeans and I just don't like the straight across cut of the boot. The steal today is the Target, Universal Thread Autumn Braided Bootie. I actually purchased these in the Spring and wore almost every day for months. They are so comfortable even wearing without socks. I love the little heal and braided accent. These also come in the black. Typically every back to school time Target runs a bogo sale on shoes, so if you aren't anxious to pick these up, I would try to hold out. What do you think about these two booties? Do you own any of them- let me know in the comments!